Continuing our survey of individual Tudor City buildings, here's the lowdown on Essex House, known within the French Company as the Tenth Unit. Carved into stone scrolls over the entrance are the words "Designed, Constructed, Financed and Managed by the Fred F. French Companies, Anno Domini One Thousand and Nine Hundred and Twenty Nine." ➺ Opened October 6, 1929. Faced with red brick, trimmed with limestone and terra cotta. ➺ 10 stories. 94 apartments, including four penthouses with roof terraces. Offers everything from studios to three-bedroom units, although the majority are larger, "family-size" units. 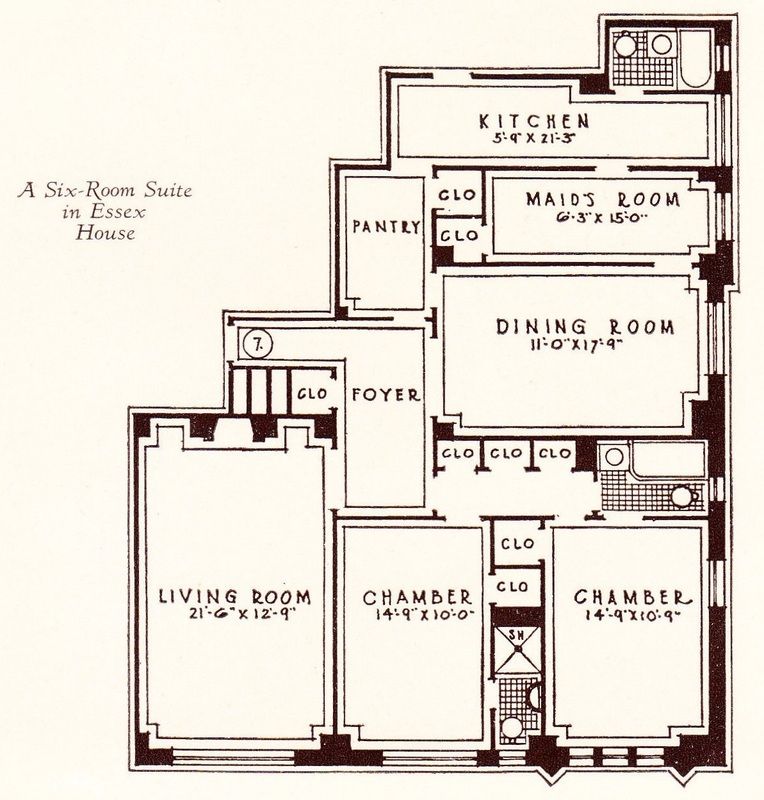 All are designed as housekeeping apartments, with larger kitchens than in the tower buildings. ➺ An entrance porch with flagstone paving connects two wings of the building and is flanked by three original iron standing lamps. Geese, Fleur-de-lis, Tudor roses, and the Shield of New York are incorporated into the design, along with winged monsters (at left). 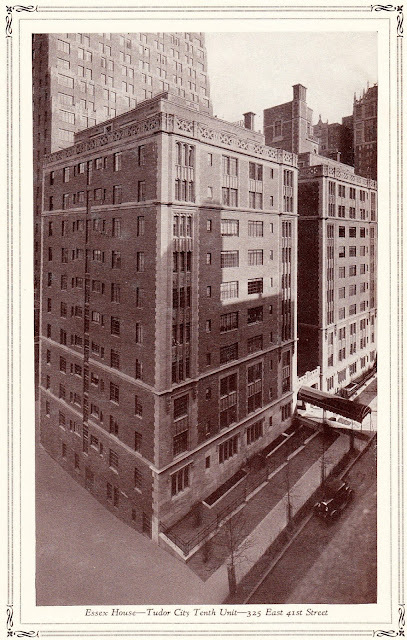 Essex House pictured in a 1930 brochure. 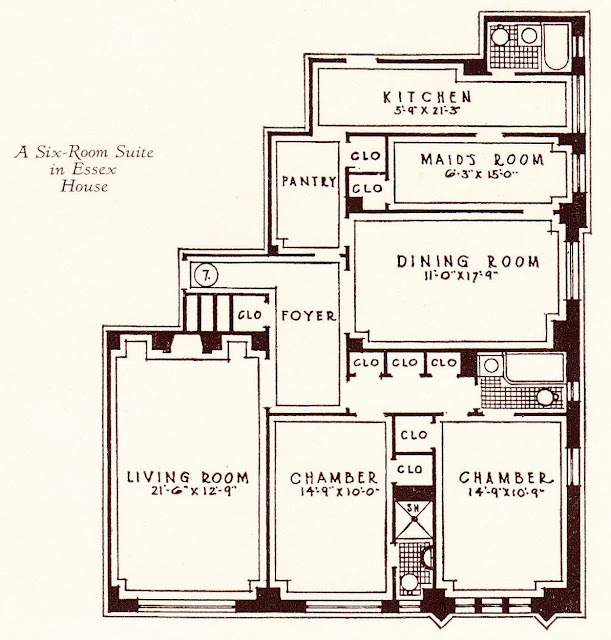 1930 floor plan for a two-bedroom, three-bath unit, complete with maid's room. Detail of 1929 ad. Marketing to families was a new concept for the French Company.